Slice onions and apple. Place in large pot with butter over medium heat, just until the butter has melted. Slowly add the beer and bring to a boil. Add brats to the pot and cook for 10 minutes. Remove the brats from pot and immediately finish them on the grill for a few minutes, just to get a bit of smoky flavored infused and char the skins. Meanwhile, strain sauerkraut, put it in a small bowl and pour 1/2 cup of the simmering liquid from the brats over the sauerkraut. Toss together cheddar cheese, Gruyre cheese, and flour in a small bowl. Heat 1 cup of liquid from the beer brats in a small sauté pan and slowly add in the cheese mixture one handful at a time. Whisking continually, add another handful of cheese only when the last one has completely melted. Continue until all cheese is thoroughly mixed and creamy. 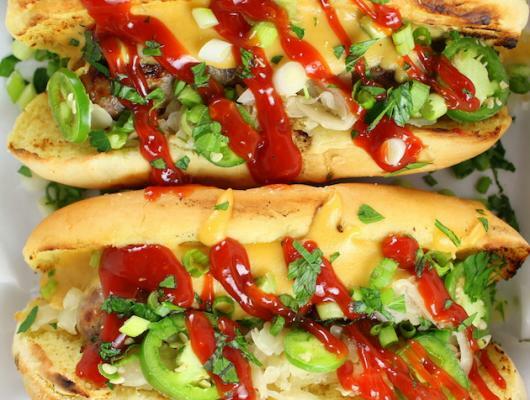 Make the Sriracha ketchup by combining ketchup and Sriracha sauce. Toast buns for 30 seconds over high heat. Add braut and sauerkraut to bun, then a layer of cheese sauce. 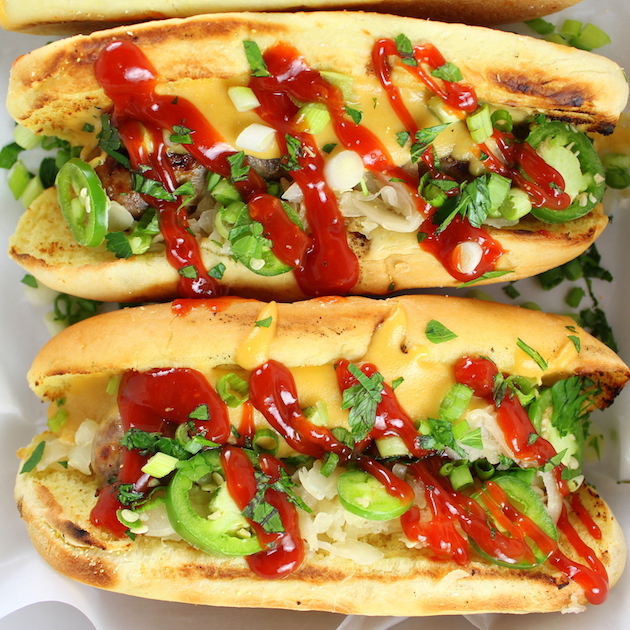 Finish with sliced jalapenos, chopped green onions, and Sriracha Ketchup. Cheesy Beer Brats with Fried Pickles - Amazing flavor! Simmered in buttery beer stock, then grilled, topped w/cheesy sauce, sauerkraut, & Sriracha ketchup.